Feeds 4 people with white rice. Combine the Worcestershire sauce, balsamic vinegar, cold water, sherry, salt, pepper and thyme in a medium mixing bowl. Stir accordingly. Add the cubed beef chunks making sure all pieces are submerged in marinade. Cover bowl and put into the refrigerator for 12-24 hours. The longer your meat sits in the marinade the better it will soak up the flavor. 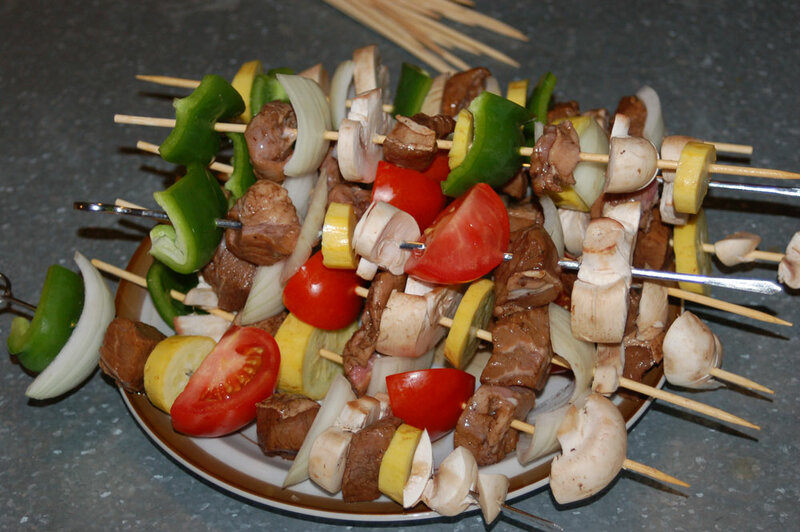 Cut up the green pepper, yellow squash, sweet onion, white mushrooms and tomatoes into pieces large enough to fit on your skewers, remember skewed items will shrink, bigger is better in this case. Arranged the now marinated meat and vegetables to your personal liking. I try not to duplicate and two ingredients in a row. If you choose to bake your kabobs preheat the oven to 425F for around 20-25 minutes. No matter which method you decide on the key is to not over cook the beef, there is nothing worse then dried out leathery meat. I serve mine with about a cup and half worth of steamed white rice. Well there you have it Boun Appetite!